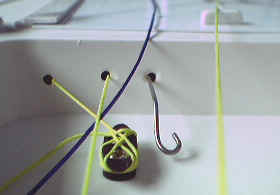 A simple length of bent wire can be used to enable the radio power switch to be turned on and off without opening the hatch cover. Most power switches come with a hole pre-drilled. Drill a 1/16" hole on the cockpit front wall in line with the power switch. Bend the piece of wire to pass through the hole in the power switch and through the cockpit wall. Bend the cockpit end of the wire into a loop for easy gripping, and also downward to prevent the sail sheets from getting caught. 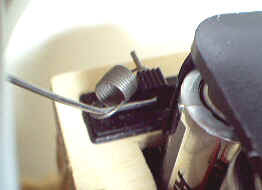 A small spring is shown to keep the wire from sliding out of the switch hole. A twist-tie would work as well.